John Louise and I decided it was time to visit Portland island today. 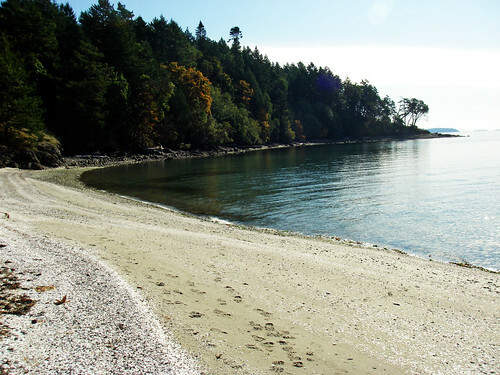 We started off at our favorite beach at Robert's Bay near Sidney. The water was a bathtub with nothing else other than traffic impeding our progress. Lots of wildlife and a fairly clear day in Fall, what more could you ask for? I arrived at Roberts bay and found the tide a ways out as predicted. John has fancy new Hully Rollers on his van, so he did a quick demo of unloading the boats even with them well overhead. Looks like a pretty pimp setup. The beach was pretty slimey as usual at low tide. I didn't see anything going on on the water at all and the marine weather was all clear of warnings. 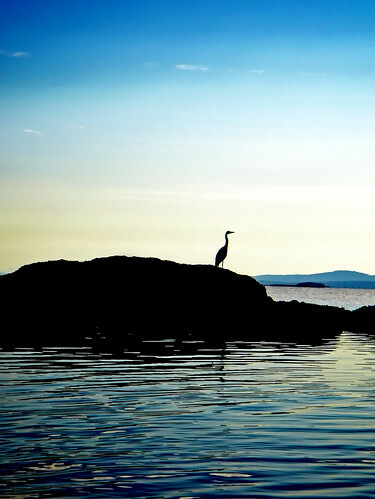 On our way out, we all got a shot of a heron looking regal on the rocks AND a seagull eating a crab. 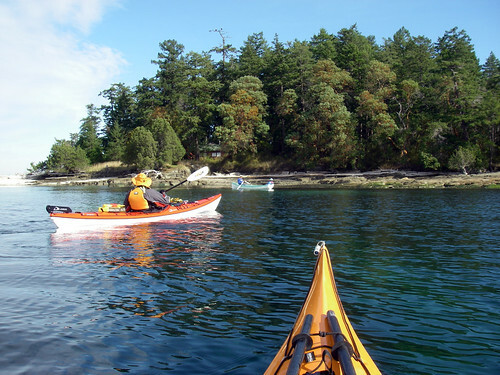 We paddled out of the Bay and around to Tsehum harbour. The harbour was full of activity with multiple vessels coming and going at the entrance. Everyone was headed in different directions to find the best wind except one mariner towing home an old motor boat with his sailboat. We chose our crossing and headed up Page/Iriquois passage with the currents acting as bizarrely as they always do. There were a number of herons hunting for fish in the passage, and most of them flew away as John got out the telephoto camera. Things got interesting as we held up waiting for the Ferry to pass. We paddled north to the Coal island light and saw the ferry coming around Portland Island. I was dead set on running the ferry wake. I got a bit of fun wake to play on and decided to continue the mission out to Pym island. When I got there I looked behind me and saw neither of my partners. ahem. woops. Turns out Louise had a bit of a fight when the ferry wake arrived at the shallows. I saw John and Louise coming across the water looking a bit addled, but they had made it and they noted that they were in new territory. So with the nerves squared away, we had a flat water paddle to Portland Island. 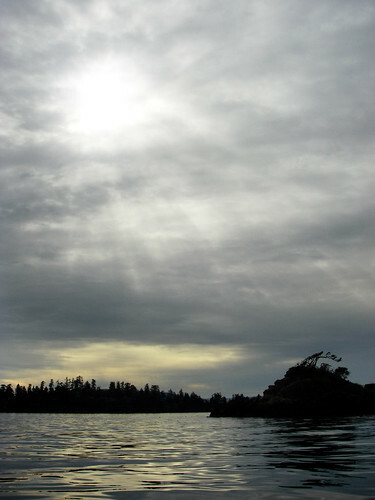 The winds diminished and the current was slowing, so we got to Brackman island in good time. There were a number of seals and shorebirds on Brackman island, but there were no signs of life at all on Portland island. The southern "shell beach" was empty and ours were the only footprints on the sand. 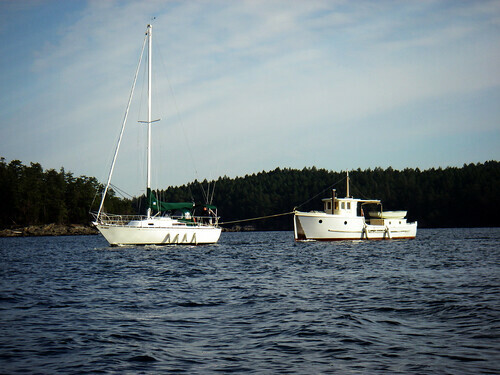 We had a little break and decided to continue our mission to circumnavigate Portland island. There's a funny effect when I paddle with John and Louise, there's these points where we all become really quiet, but not like awkward-like. It's like it's an accepted part of our conversation just to shut up and realize where we are for a few minutes. 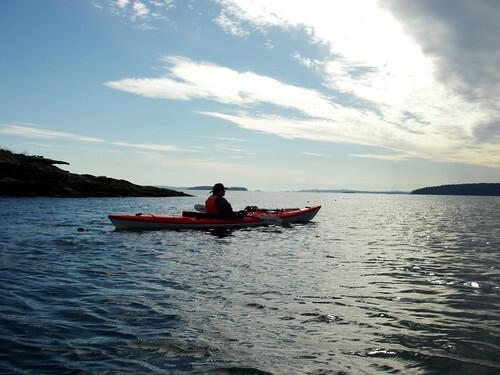 The silence broke when we approached Chads island and saw two eagles and a huge seal haulout. There was a small blue rowboat coming through the passage between Portland and Chads and we didn't make much contact. We also kept a cautious eye out for Ferries in Goss passage, multiple boats all went by at the same time and we decided to get away from the rocks. 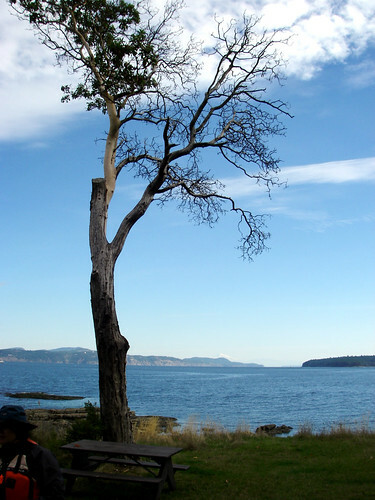 From there, it was a quick paddle to Arbutus point for a quick look around. There were a few damaged trees on the grounds and the campsite was empty. The view was spectacular though. There was light haze over Moresby passage and it made the entire area look like a fairy tale. I showed John and Louise the famous composting toilet on the island - I mean... we had to see the whole Island, right? High clouds started to roll in and the sun was being blotted out. After an interesting beach launch, we rounded the reef near the campsite and headed down toward the marina. The water was quite flat and the air was even lighter than before. Haro strait was becoming a massive bathtub with the only fair air out near Moresby, even there, the sailboats weren't making much way. The Marina was sparsely populated with mostly live-aboards. The cliffs on the island led to these strange erosion structures that looked like caves or those things you see on mystic beach, shallow shelves formed by water over the years. I kept a mental note so I could go back and visit them again later. 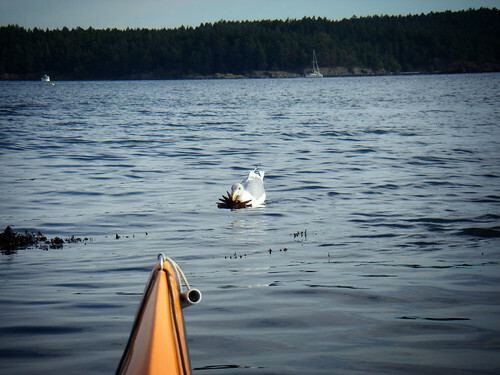 We met up with the folks in the row boat again and they had found a neat little trick in progress: A raccoon was swimming from one of the outer islands toward Portland island. Apparently it wasn't shy about it's trek, mostly ignoring the nearby watercraft. It was time to head home, so we got away from the reefy side of Pym and crossed back the way we came in. 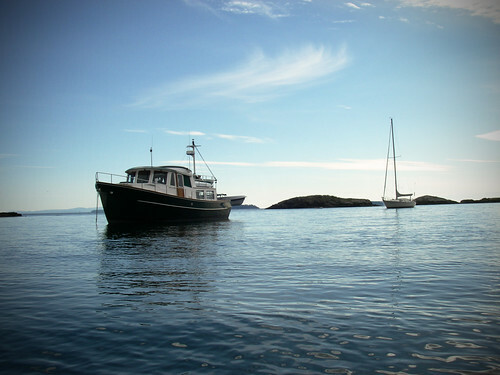 There was no traffic in Colburne passage, so we went for the marina right near Swartz bay. There was nothing remarkable on the trip back, we got to the beach at a nice high tide and had a really short walk up to the cars. 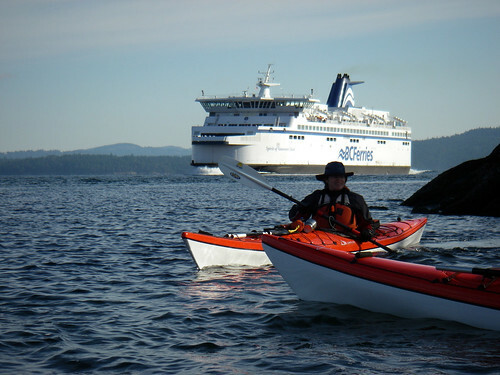 Overall, I'm really happy to see my paddling buddies doing these long outings! These new boats have made a big difference in their comfort level with slightly wavier situations. PS. When I got home, I noticed that Sean Morley is home and safe in Port Hardy. Can't wait to read the post-mortem on that epic trip. I'm still floored that anyone can make it around the island in just 17 days!